The debate on EMU deepening is entering a critical stage. The contribution of 14 French and German economists (Benassy-Quéré et al. 2018) is therefore timely. It suggests ways for reconciling risk-sharing with market discipline – where the biggest divisions lie. Their initiative overlaps in spirit and with much of the substance of the European Commission’s May 2017 Reflection Paper on Deepening EMU (European Commission 2017a) which identified indispensable components of a comprehensive reform of EMU (see Buti et al. 2017) and underpins the subsequent Commission's initiatives (European Commission 2017b). Benassy-Quéré et al. put forward several attractive ideas on how to reform EMU. At the same time, the mix of proposals seems unbalanced and carries significant risks. 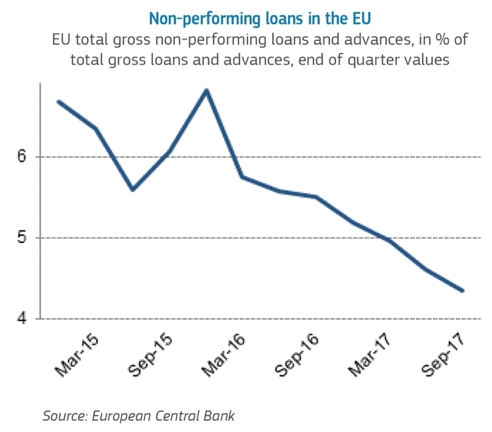 The diagnosis of the crisis overlooks crucial issues such as macroeconomic imbalances and adjustments within the euro area and the redenomination risk connected to acute liquidity and credibility crises. As such, the proposals are mainly geared at increasing market pressure on fiscal policies, and are aggregated without appropriate sequencing necessary to contain macroeconomic and financial risks. Benassy-Quéré et al. aim at making the ‘no-bailout’ clause (Article 125 TFEU) more credible, which is a desirable objective. Acountry not respecting its fiscal targets would face heightened market pressure, as ultimately it would be forced into outright default. They focus therefore on defining ‘when’or ‘how’default should take place, through the equivalent of a Sovereign Debt Restructuring Mechanism, or SDRM (Corsetti et al. 2016): governments missing their expenditure targets would issue junior national debt, which would be automatically restructured should the country require ESM crisis support. But market forces must be handled with caution. Financial markets tend to operate along horizontal (benign neglect) and vertical (overreaction) lines. The proposals by Benassy-Quéré et al. concentrate both liquidity and credit risks on a very narrow tranche of national debt. 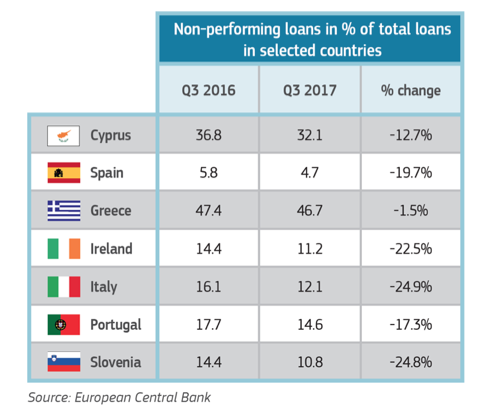 This would take Europe into uncharted waters and raises significant questions.2 While in theory the proposals concern only the flow of debt, the crisis showed that markets fail with critical spillovers across assets issued by a country, and across jurisdictions. These proposals could generate self-fulfilling prophecies, with uneven market reactions to changes in perceptions and credibility of governments, destabilising financial markets. As costless defaults are an illusion, rather than forcing defaults it would make more sense to work to reduce the economic, financial, and political costs in the extreme and unlikely case that a sovereign debt default becomes inevitable in the euro area. This alternative approach would involve: (1) making the financial system more resilient to such a default event (see below); (2) improving the EMU architecture to make defaults even less likely; and (3) clarifying ex ante 'who’would bear the cost of a government default. Sovereign bonds have a particular role in funding public expenditure and as benchmarks for national financial systems, which explains why they enjoy a risk-free status across all advanced economies. If the regulatory treatment of bank sovereign exposures were to be changed in isolation, or with an inappropriate combination or sequencing, the consequences could be material and unpredictable for financial stability. A regulatory reform to reduce excessive concentration of sovereign bonds in the banks’ balance sheets could reduce the impact of government defaults, improve incentives for governments and avoid any possibility of indirect financing, but only if such reform were implemented wisely, gradually, and as part of a well-sequenced package. The right sequencing would depend not just on having a deal on the deposit insurance, as proposed by Benassy-Quéré et al., but on key steps to improve the functioning of financial markets: completing Banking Union, progressing towards the Capital Markets Union and reaching an agreement to launch a genuine European safe asset. This should not be seen as a way to delay progress but rather as an argument that all these elements of the package should be considered as soon as possible. A genuine European safe asset would create a large, homogenous, and hence liquid euro area-level bond market; it would avoid ‘sudden stops’ and reduce the financial fragmentation that blunts the transmission of monetary policy; it would replace sovereign bonds on the banks’ balance sheets, hence mitigating the sovereign-bank loop; and it would increase the total supply of European and global safe assets. It would therefore improve debt dynamics across the Euro area. Mutualised solutions such as Eurobonds (De Grauwe and Ji 2018) or Blue-Red bonds (Delpla and von Weizsäcker 2010), while appealing, have limited political tractionat this juncture and would require a change to the EU treaties. Sovereign bond-backed securities (Brunnermeier et al. 2016, ESRB 2018), while increasing diversification and the supply of safe assets, are unlikely to fulfil all the objectives of a genuine European safe asset, as many market analysts, academics and sovereign debt managers have highlighted, even if regulatory barriers are removed. In addition, introducing SBBS alongside Accountability bonds, as proposed by Benassy-Quéré et al., would also dangerously fragment bond markets even more. A recent paper (Leandro and Zettelmeyer 2018) concludes that safe assets could be produced without mutualisation in sufficient quantities to replace the euro area banks’ current holdings of sovereign bonds, which would make them more immune to defaults. 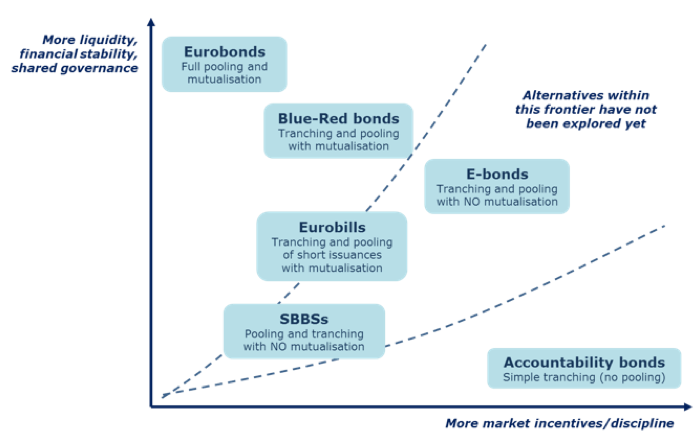 Among the non-mutualised options, so-called E-Bonds (Monti 2010: 61-65, Juncker and Tremonti 2010) – whereby the whole national debt is subordinated to any funding received from the common issuer, which may well be the ESM or the EIB – could directly exert fiscal discipline (by raising the marginal cost of sovereign debt issuance, without raising the average costs for lower-rated borrowers). Against the current lack of trust among European countries, an option balancing and indissolubly binding significant common issuance with market discipline could overcome the reciprocal fear among member states that others may backtrack on agreed reforms (see Figure 2). Its introduction would facilitate a progressive implementation of concentration charges, the prospect of which could help a rapid agreement on both the deposit insurance and the backstop, while it may alsosmoothen the reduction of the ECB’s balance sheet. Source: Buti et al. (2017). The proposals in Benassy-Quéré et al. (2018)are welcome and the main message should be heard loud and clear: there is a need to strengthen EMU through parallel risk reduction and risk sharing, complementing each other within a package of reforms. Risk reduction has to continue, but one should avoid changing the goalpost before risk sharing takes place. In the paper the exact sequencing is however unclear, not all necessary elements are covered, and some proposals create risks. The diagnosis overlooks some key aspects of EMU (internal imbalances, liquidity flows, redenomination risks) and the focus of the proposals on reducing fiscal risks could rather lead to financial distress ultimately requiring more, not fewer, rescues. After all the effort to regain financial stability, there is a need to advance without delay, but with a coherent and well-sequenced package, avoiding unsafe steps in the dark. Authors’ note: The authors are writing in their personal capacity and their opinions should not be attributed to the European Commission. Buti, M, S Deroose, L Leandro, and G Giudice (2017), "Completing EMU", VoxEU.org, 13 July. Corsetti, G, L Feld, R Koijen, L Reichlin, R Reis, H Rey and B Weder di Mauro (2016), "Reinforcing the Eurozone and protecting an open society", VoxEU.org, 27 May. De Grauwe, P and Y Ji (2018), “How safe is a safe asset?”, CEPS Policy Insight No. 2018-08. European Commission (2016), “Reforms to further strengthen the resilience of EU banks”, 23 November. European Commission (2017a), “Reflection Paper on the Deepening of the Economic And Monetary Union,” COM(2017) 291, 31 May. European Commission (2017b), “Further steps towards completing Europe's Economic and Monetary Union: a ROADMAP”, COM(2017) 821, 6 December. European Commission (2017c), “Completing the Banking Union”, COM(2017) 592, 11 October. European Commission (2018), “Commission measures to address the risks related to NPLs”, 14 March 2018, IP/18/1802. European Systemic Risk Board (ESRB) (2018), Sovereign bond-backed securities: a feasibility study, Report of the High-Level Task Force on Safe Assets. Juncker J-C and G Tremonti (2010), "E-bonds would end the crisis", Financial Times, 6 December. Leandro, A and J Zettelmeyer (2018), "The search for a Euro Area Safe Asset", PIIE Working Paper 18-3. Monti, M (2010), A new strategy for the single market, Report to the President of the European Commission José Manuel Barroso. See European Commission (2016, 2017c, 2018). Such as: What happens if fiscal targets are missed because of forecast errors or surprise elements, rather than wrong policies? If bonds are meant to be issued only rarely (as countries would normally stick to the fiscal targets), how easy will it be to issue them in a very thin market? Who would enforce their issuance? What happens if there is no buyer at any price (something that we also experienced during the last crisis)?